Each month the Anoka Knights of Columbus choose a family that models Christian family values and visibly live by them every day. 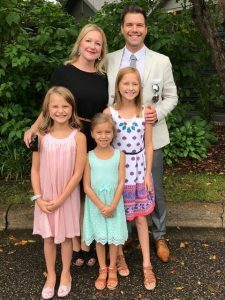 The family chosen for November 2018 is the Chuck and Kelly Blair family from Anoka, MN. Chuck and Kelly have been married for 14 years and have three daughters that attend St. Stephen’s school and participate in the parish choir. Kelly was born into a Catholic family, and Chuck was baptized and confirmed into the faith in 2004. They both believe that their Catholic faith is the bedrock of their marriage and family. A family tradition that they have started is sitting in the front row of the church during Mass. They do this so that the girls can see better and jokingly tell them that the priests will notice if they’re not paying attention. Sports and extra-curricular activities take a back seat to “quality time” in the Blair household. Eating dinner together is a top priority for each family member and their dinners occasionally include guests of extended family members and priests. Also included on the family recreational fun list are boating, fishing, reading, walks, watching movies and completing puzzles. Both Chuck and Kelly are active in parish life. Kelly has been heavily involved with transitioning the parish fundraisers from Summerfest to Fall Fest and the Spring Raffle Fiesta. She is also on the school advisory committee and the development committee for the school. Chuck coaches the school’s soccer team and is an active member of the parish’s Mens’ Group. Both Chuck and mentor parish couples to help prepare them for the sacraments of matrimony and baptism.